Social media has many benefits. It can help you increase brand awareness, drive sales, boost customer loyalty, and much more. But there’s one thing that you should pay great attention to on social media, and that is interacting and communicating with your audience. This is a crucial part of social media success, yet, still, many brands forget this aspect of the social media strategy. Sure, using social media to communicate and interact with your audience is a bit time-consuming, but it is well worth it. Social media allows you to establish strong relationships with your audience, engage with them on a deeper level, and ultimately increase their trust in you. And in case you didn’t know, trust leads to sales. The fact that social media gives brands a direct channel to instantly communicate with their customers is amazing, and it opens up completely new opportunities for brands, but unless you’re utilizing it, you won’t be able to taste the fruit. Yes, social media has the power to drive a lot of incredible results, as you are probably familiar with, and a lot of that starts with engaging with your audience. I mean, the fact that social media is called social says it all. In fact, Nielsen has found that 33% of customers even prefer to contact brands using social media rather than the telephone. Social media communication is not only about customer service, but it is taking every opportunity you can get to communicate with your audience to build stronger relationships with them, and making them more loyal and engaged. In this article, we’re learning How to Use Social Media as a Communications Tool With Your Audience. 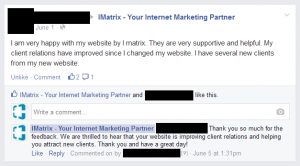 There are many different types of messages your customers can send to you on social media. Therefore, it’s essential that you have a clear strategy, and know exactly how you’re going to tackle each question in the best possible way. When it comes to which messages you should respond, it’s actually not that complicated. You should respond to every single message except offensive and inappropriate messages. However, it is important that you learn to separate offensive content from criticism and complaints because these are probably the most important type of questions you should respond to. Of course, I am not stopping you from responding to offensive content, but more times than not, offensive content does nothing more than spread negativity, and don’t bring any value, so therefore, you’re almost always better of deleting them. I see so many brands that either haven’t understood the importance of engaging and responding to their audience on social media or, that just don’t care, or, care, but don’t have the resources. But either way, it is harming their brand substantially. If you want to get the most out of social media, you need to put great effort into customer communication. 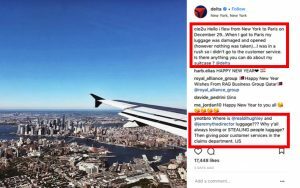 Let’s look at the most common social media customer messages and how you’re going to tackle them in the best possible way. Questions are the most common type of customer messages to brands on social media. When someone asks a question, you should always respond. The only exception to why you wouldn’t is if it’s an offensive question. Responding to customer questions shoes that you acknowledge and value your customers. It also shows them that you have great customer service and that you are a brand to trust. A simple search on Instagram shows us that many large brands, unfortunately, miss out on this. And when you don’t respond to your customers on social media, you do the opposite of the things above. You show your customers that you don’t care about them and that you don’t value them. If someone talks to you in real life, you respond, right? You don’t turn your head the other way. And the same goes for social media. Some people tend to believe that social media is any different than real life, but when it comes to human interaction and communication, the principles are exactly the same. User-generated content can be any type of content that refers to your business. It can be a photo of your hotel, it can be a video of your customer using your skateboard, it can be a testimonial or just a simple check-in. Either way, you should acknowledge all of these. 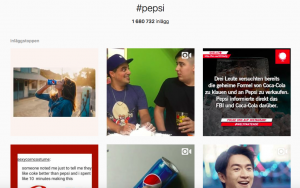 Example of user-generated content for Pepsi on social media. Not only should you acknowledge user-generated content because it is extremely effective in marketing, and can be implemented into your very own social media strategy to generated amazing results, but when your customers share UGC, it gives you an exceptional opportunity to engage with them. In case you’re unfamiliar with the power of UGC content on social media, take a look at these statistics. When your customers create and leave UGC of any sort, you should acknowledge them and thank them for supporting your brand. If you want to ignite a conversation, ask questions and if they’ve created any visual content, compliment them on how good they are. By having deeper conversations with your audience other than just ”nice, thank you”, you’ll be able to establish a better and stronger relationship with them, which ultimately leads to increased trust in your brand. You should always work towards establishing yourself as a thought leader and an authority in your space because doing so means you become the go-to source for information in your space, which ultimately means that you’ll attract customers. But the truth is that you won’t become an authority overnight, and becoming one means consistent work. One of the best and most effective ways in becoming an authority is to hop into industry conversations that your customers have. In these conversations, people talk about things in the industry, such as events, or argue and share different views on things. Of course, you’re not alone in wanting to build your brand and authority, which means other people are sharing information and content that shows their expertise, and this is something you want to be doing as well! The key to becoming an authority, among many other things, is to show your expertise. If no-one knows that you are an expert that carry a lot of knowledge, people will never start coming to you for advice and thoughts. You need to share that knowledge with the world. Remember that communication is a two-way conversation, so when people say something, make sure you actually listen. It’s not only about contributing by sharing a bunch of articles and content that you’ve created before, but when it comes to conversations, it’s more important that you take part live and on the spot, and share your opinions and expertise directly. Listen to what other people have to say, and then add value to that. What’s more, don’t forget to ask questions, and if you see that someone is blatantly wrong, then say that you don’t agree with them. There’s a fine line between starting arguments and saying that you don’t agree, so make sure everything you say can be backed by facts, so you can actually prove they are wrong. When you start participating in industry conversations, you’ll not only start building a name for yourself, but you’ll also start establishing relationships with the people you are communicating with. What’s more, you’ll also be remembered as the industry guru. Of course, first you need to actually find the conversations, and you do so by using the tactic social listening. On social media, luckily you won’t only be receiving negative complaints. But that does not mean that you shouldn’t be responding to them. As mentioned earlier, all messages except offensive messages need responses on social, but if you cannot remember which messages don’t deserve responses, make it a rule of thumb to respond to every single one you receive. It’s better that way. The people who take the time to write positive reviews on social media are the type of customers that are most loyal and absolutely love your brand. Maybe they are brand advocates, or maybe they have the potential in becoming one. Starting with the obvious means that you need to be responding to them. Tell them how happy you are that they are satisfied with their experience, and thank them for their trust in your brand. The most important part is that you acknowledge them and show them that they mean something to you, that you value them. If customers don’t feel valued, there s a great risk that they’ll go to your competitor, where they’ll hopefully get some love. The best kinds of posts are the ones full of love. If someone writes on your accounts with positive feedback, you can still respond to show your thanks. Let these people know that their compliment didn’t go unheard. Bad reviews are the type of messages where it is most important that you respond, and that you respond quickly. When someone complains, it usually means that they’re really upset and disappointed with your brand. But this does not mean that you’ve lost them forever! In fact, 91% of unhappy customers will not willingly do business with you again. On the contrary, if you resolve a complaint in the customer’s favor and they will do business with you again 70% of the time. This means that it is crucial that you put great emphasis on providing your audience with superior customer service. 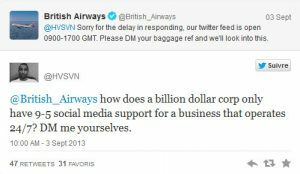 Far too often, I see brands completely ignoring their customer complaints on social media. And it’s not just because they don’t have the resources to respond, because I see multi-billion dollar companies like Coca-cola and Delta not doing it, and I see small startups ignoring angry customers. I haven’t quite figured it out, but I am suspecting that it is because the brands haven’t really figured out use how crucial is for keeping your customers, being able to engage with them continuingly, as well as making them repeat customers. Responding to customer complaints is an art that needs to be mastered, and when dealing with angry customers, you must handle with care. One more mistake, and one misstep and you risk losing them forever. Therefore, it is crucial that you know exactly how you’re going to respond in that situation. If someone writes a negative response about you on social media, the issue is not just if you respond or not. The issue is that it is open for the world to see, and everyone is watching your every move. If people see that you aren’t even responding, they’ll think your customer service is terrible (which it most likely is if you don’t respond), and they’ll shy away from buying from you. If people can see that you aren’t responding to your customers when they’ve had a bad experience, they’ll get afraid that the same can happen to them. As result, there’s a risk they’ll ignore buying from you. When responding to complaints, the most foundational is that you apologize for the inconvenience you’ve caused them. Remember that people aren’t interested in hearing explanations. They want to see you solve the problem, and often times, also offer them a compensation. The absolute worst thing you can do is delete a negative complaint on your page. Not only can you be sure that the customer will become even more disgruntled and tell all their friends about how terrible you are, and you can be sure that you’ve lost that customer forever. When you start looking at customer complaints as an opportunity for you to engage and communicate with your customers, it is presented in a completely different light. Instead of seeing complaints as something that has to be dealt with, see them as opportunities for you to improve your relationships with your audience and make them more engaged and loyal to your brand. Social listening is crucial for brands and those who don’t use it miss out on a ton of messages from their customers that need answering. Social listening means listening on social media for people who are talking about your brand. Because when someone talks about your brand, the vast majority of them expect responses. And even if they don’t expect you to respond, you should. But not all the people who talk about your brand, or even talks about a problem they have that your brand could solve, mentions your brand directly through the @ – tag so you can easily find them. Some people might mention your brand without the @ tag, some might misspell your username, some might use your hashtag, and so on. With social listening, you identify the conversations that are taking place around your brand so that you can hop into their messages and start communicating with them. When you don’t respond to people’s messages, many people will believe that it is because you don’t care about them. The reality, however, might just be that you haven’t seen their message. The messages you have closest at hand are the messages that end up in the comment sections of your posts, and that is a good start. But don’t forget that there are tons and tons of more messages circulating around your brand that you just haven’t found. Just because you haven’t listened. Social listening has many other benefits than just the fact that they give you an opportunity to start communicating with your followers. By actually listening to what your customers are saying, you can get a better understanding of what people think about your brand, what issues they are facing with your brand, and if they have any tips that can help you improve. Remember that the best feedback comes from people who are in contact with your brand or products daily, because these people are really putting them to test, and knows what can be done in order to improve. The people who approach you might not just have a simple question. Instead, they might be looking for more information and need help getting a particular question answered. When you give people something – it can be anything really, you create reciprocity. This means that because you’ve given a person value, they’ll feel the urge to return the favor, and a way for them to do so might be to buy from you. 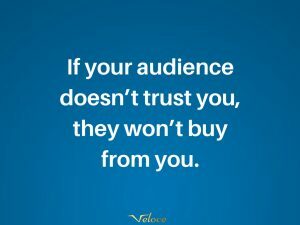 This is why it is so beneficial for brands to provide value to their audience because the more value you provide your audience, the more ”guilty” your audience will feel to pay the favor. But when you give your customers additional information, answering question after question they have isn’t the most effective way. This is where having a created content that answers their questions come in handy. When you have written, for instance, articles or create videos that answer your questions, you can just direct them to them to get answers to their questions and help them out. The more you do this, the further down your sales funnel they’ll come. Humans are emotional creatures, and as a brand, you always want to strive for building strong relationships with your customers. Using emotions when communicating with your audience allows you to do just that. If you’d only talk about shallow things like the weather and recent events with your best friend, would they be your best friend? If you, as a brand, can impact your customers, for example by making them laugh, shed a tear, or make them happy, a bond will be created between you, and this isn’t just a bond of good relationship, but an emotional bond that causes a deeper connection with your brand. If you didn’t know, emotions are tremendously powerful in all aspects of marketing, and not just when building relationships and communicating with your audience. In fact, a study by the Institute of Practitioners in Advertising found that ads with purely emotional content generated twice as much profit as ads based on rational content (31 percent vs. 16 percent). According to a 2016 Nielson report, “Emotions are central to advertising effectiveness,” and ads that generated the best emotional response generated a 23 percent lift in sales volume. if you can make your customer laugh when you are talking to them, you can be quite sure that they’ll stay glued to your brand forever. Knowing your target audience and what people it consists of is important for many reasons. When it comes to communicating, it is central, because your target audience will ultimately decide what brand voice and personality you’re going to have. As a brand, you want to have a brand voice that resonates with your audience and that appeals and speaks to them. In other words, you should use a language that is quite similar to the ones they are using. Doing so allows them to better resonate with you and ultimately build stronger relationships. For example, if my target audience consists of people in the 60s, then I probably shouldn’t be using slang or any modern abbreviations, right? Because if I would, I’d distance myself from my audience, and risk alienating them. This is why it is important to first define your target audience and then off of that, create a brand personality and brand voice. Listening is crucial for good communication. Obviously, it’s hard to communicate if you’re only talking and not listening. After all, it is, as familiar, called social media. And this means talking and listening. If you’re never listening, you’ll come off as self-centered, and as a brand overly promotive. Take the time to carefully read through what it is your customers are saying before you respond. This is especially important if they’re complaining. When someone is complaining, it is almost crucial to read through it several times to put yourself in their shoes and be able to determine if they have a valid point or not. 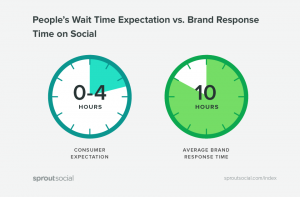 A study by sprout social found that people expect brands to respond within 3 hours who it comes to customer service on social media. The reality is that brands respond within an average of 10 hours. Social media is a fast-paced landscape that is on 24/7, and this means that you have to be, too! Now obviously, it’s difficult to be online non-stop all day every day, because it would take a lot of resources, but you should try your very best to be ready to respond as much as you can. The customer sure has a valid point. I mean, chances are, your own social media is probably more approachable than multi-billion dollar companies. If it’s any brand that should be approachable 24/7 on social media, it is multi-billion dollar companies that operate 24/7, don’t you think? The bottom line is that speed is crucial for responding to your customers on social media, no matter if it is a complaint, praise, or question. If you don’t respond, eventually people will lose patience, and at worst, they’ll go to your competitor. Social media has completely revolutionized the way we communicate. The good news is that it has completely revolutionized the way brands communicate with their customers. Back in the days, the only way for brands to talk to their customers was through telephone or in real life. Today, you can reach people from all around the world and talk to people has never been easier than it is today. If you’re a brand but aren’t leveraging social media for communicating, engaging, and building relationships with your audience, you’re missing out on tremendous opportunities. Let me know if and how you use social media for communicating with your audience!